Hey, one of these is not like the others! Do you spot the mistake? (You can see it in the top picture, too) I see it, and guess what? I don’t care! Lalala, lalala! Since when have I become so lax and un-perfectionist? It’s either the calming smell of Murphy Oil Soap as I knit, or too many other WIP to divert my attention. Ideas, suggestions, comments: I love this yarn! Love it! It’s so much fun to knit with, although it definitely needs slippery, buttered-up needles because the elastic yarn hugs them. I would definitely work with it again (and I will, because I have 2 skeins of white, and 2 skeins of mauve). In my opinion, solid-colored yarn really showcases this pattern, while highly variegated yarn hides it. 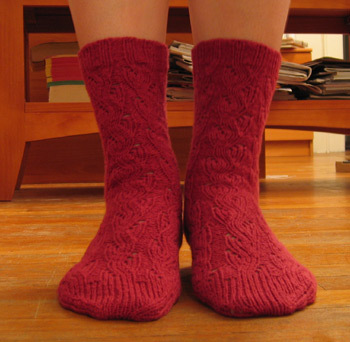 I don’t think this pattern (as it’s currently written) is good for a first-time sock knitter. 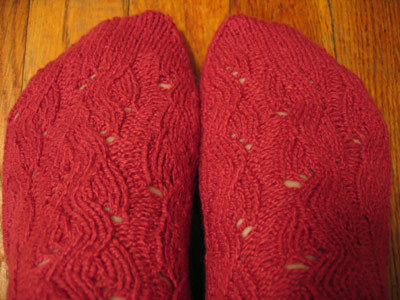 The short-row heel instructions are atrocious, and the transition between the ribbing and the pattern is not centered. Otherwise, well, it’s quite cute and very comfy! One more thing: did I mention that my feet are always hot? Well, I wore these socks for a bit today while taking the pictures, and I think this cotton will be too hot for my footsies until we’re well into the fall. For now they’ll reside in my sock drawer :). LOVE THEM!!!! Beautiful! I am so jealous! Can I say that I have two balls of white just awaiting some buttery needles! Pretty comfy socks…here I come! P.S. To all you knitters of wonderful things…please stop…I want to knit them all! Oooh! So pretty! I love them. I think I have another pattern by Debbie Young (have to look it up) but I’ll be more cautious if I ever knit her patterns again. those are very very lovely dainty socks! Beautiful! And a note to others who might consider using this yarn. I am currently knitting boring plain white sport socks with the Sock it To Me Esprit using my Bryspun DPs and the yarn and needles are quite compatible. Beautiful socks!!! I didn’t look at the socks hard enough to spot the difference. Feet *too* hot. I have never had that experience in my life. Not once! ooooo, they look stellar! and I see no mistakes! Your socks look awesome! Socks are such addictive little suckers. Your socks are gorgeous! I wandered here through ‘the Blue Blog’, and boy, do we have things in common – I am also at H Univ AND I just finished the exact same pair of socks in the exact same yarn, in the exact same color last week! What are the chances of that? BTW, your cardigan is so pretty! I did one sock on #3 Brittany birch dpns and the other on a 40inch Addi using the magic loop technique. Normally I find the long Addi needle faster when knitting socks, but in this case the yarn hugs the needle so much, the two techniques took about equal time. i love the socks! the colour is gorgeous and brings out the pattern beautifully. congrats! ooooh, those are so gorgeous!